"What UFO references? There may be a couple, but far fewer than rock journalists have led you to believe." Derek can only be viewed in black and white by ordinary mortals. 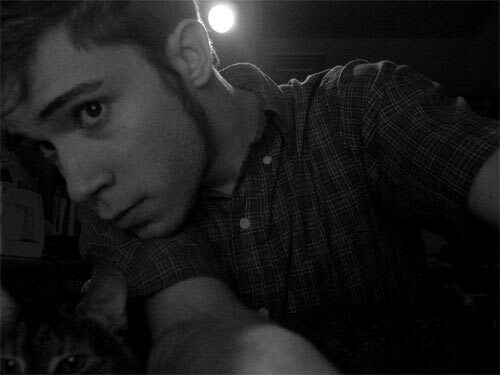 Derek (aka ProverbialCereal) is about 23 years old and resides in the state of North Carolina. He is going to school for graphic design, digital video, and other multimedia. He enjoys working in Final Cut Pro, Photoshop, Dreamweaver, Flash, Logic, and Notepad (the ultimate tabbing weapon). He especially loves the art of filming and editing, and also writes his own music. Whether he’ll end up in audio engineering or with video for his career, is uncertain at this point. He likes listening to music on his 60 GB video iPod, with a high bit rate, such as: Tom Waits, Failure, Weezer, Jeff Buckley, the Living End, the Dismemberment Plan, Soulwax, Elliott Smith, Andrew Bird, Beck, Bonnie ‘Prince’ Billy, Hum, Muse, Neutral Milk Hotel, Wilco, XTC, Dave Brubeck, System of a Down, and the Shins. His favorite TV shows are Lost, Firefly, Family Guy, and Battlestar Gallactica. Derek enjoys Junior Mints while watching these. History of the tabs: In 1999, Derek started a web site exclusively for Frank Black tabs. You can still visit the old angelfire site, now with complimentary pop-up ads. When FB.net was created, he naturally joined the web team when he was asked to hop on board. Of course he still likes figuring out Frank Black’s roller coaster chord progressions.